Neutrophils are produced in bone marrow, released into blood after completing their maturation in marrow, circulate for less than a day (5-15 hours), and migrate out of the vessels into tissues or into alveoli and gut lumen. Effete neutrophils (that have finished their lifespan) undergo apoptosis and are removed by macrophages, in a process called efferocytosis (Duffin et al., 2010). While circulating, neutrophils are distributed between large vessels (neutrophils here form the circulating neutrophil pool or CNP; these are the neutrophils in the usual blood sample) and small vessels (neutrophils here form the marginating neutrophil pool or MNP). The total body neutrophil pool or TNP comprises the CNP, MNP, and the pool of post-mitotic neutrophils in marrow. The ratio of neutrophils in the MGP to CGP is about 1:1 in most species, except for cats, which is up to 2-3:1. Alterations of the MGP:CGP ratio will cause changes in the number of neutrophils sampled during blood collection, and contribute to changes in the CBC neutrophil count seen from certain substances such as epinephrine, corticosteroids and endotoxemia. With a decrease in marginating pool, we could expect to see a 1 fold increase in neutrophils (e.g. 2x upper limit of the reference interval) in most species, except for the cat, where we could see a 2-3 fold increase. Humoral factors produced at sites of inflammation stimulate increased production of neutrophils in marrow and increased release of neutrophils from marrow. Chemotactic factors, such as interleukin-8, produced at sites of inflammation direct migration of neutrophils from blood vessels into the tissue at those sites. Normally, neutrophils are released from marrow in an age-dependent manner, i.e., the most mature cells are released before less mature cells. Endotoxin tends to cause sequestration of neutrophils in the spleen, liver, and lung, thereby lowering the neutrophil count in a blood sample. Terminology associated with neutrophil changes (proportions of mature/segmented or immature/band neutrophils) can be confusing. For more information on this, please refer to leukogram patterns for useful tips and a guideline table. Neutrophilia is an increased numbers of segmented or mature neutrophils (absolute numbers not percentages), and can occur due to the following mechanisms, the most common of which is corticosteroids, epinephrine and inflammation (increased production and release from bone marrow). Shift from marginating to circulating pool: Corticosteroids and epinephrine cause movement of neutrophils from the MNP to the CNP. Both hormones contribute to neutrophilia associated with excitement or stress (physiologic and stress leukogram, respectively). Inflammation: Inflammatory cytokines stimulate release of the storage pool of neutrophils (which is lower in ruminants). If inflammation is moderate to severe, band forms may be released as well. Corticosteroids: Can also can cause the release of neutrophils from the post-mitotic storage pool in marrow. Usually only mature segmented neutrophils are released, but with chronic usually high dose (immunosuppressive) steroids, you can see a mild left shift (300-400 cells/uL) with no toxic change and usually a normal segmented neutrophil count. Increased production by bone marrow (takes 3-6 days): Response to inflammatory cytokines (inflammation), which stimulate granulopoiesis. Neutrophils (mature and immature forms) may be toxic if there is accelerated or premature release of cells. Note, that mild inflammation will only trigger a mature neutrophilia, whereas bands and other forms of immature neutrophils may be released with more severe tissue demand and a robust marrow response, particularly in those species with a low marrow storage pool (e.g. ruminants). Decreased migration into tissue, e.g. lack of adhesion molecules in bovine or canine leukocyte adhesion deficiencies prevents neutrophils from adhering to activated endothelium and responding to a source of inflammation. Affected animals typically have very high leukocyte counts and persistent or repeated infections. This is an uncommon cause of neutrophilia. Delayed apoptosis: Prolonged survival of neutrophils can be seen under some situations, e.g. corticosteroids, inflammation. In these cases, neutrophils may be hypersegmented. Common causes of neutrophilia include inflammation (either infectious or non-infectious [trauma, surgery, burns, etc. ]), exogenous or endogenous corticosteroids, and epinephrine. Immune-mediated diseases such as immune-mediated hemolytic anemia are also commonly associated with neutrophilia due to actions of inflammatory cytokines. A neutrophilia is a feature of several different leukogram patterns, including an inflammatory leukogram, stress leukogram, and physiologic leukocytosis. Strenuous exercise in horses, whether associated with extreme stress (Schalm’s Veterinary Hematology, 4th edition) or training (Rose et al 1983), can cause an increase in neutrophil counts. In one study of 16 unbroken Quarterhorse yearlings, the neutrophil count ranged from 3,700 to 14,400/uL, immediately after being caught. Most of the caught horses had a lymphocytosis (>4,600/uL) (Schalm’s Veterinary Hematology). Over 6 weeks of training, the average neutrophil count increased from around 3,500 to around 5,300/uL after exercise and was within baseline 30 minutes post recovery (Rose et al 1983). In another study of racing horses, the average neutrophil count did not change within 10 minutes after racing (Snow et al 1983). In both of the latter two training studies, an increase in lymphocyte count and PCV were more consistent findings. Note that at Cornell University, we restrict the phrase neutrophilia to an increase in mature or segmented neutrophils not an increase in immature neutrophils (bands and other forms, but bands usually dominate). An increase in immature neutrophils is called a left shift and is usually proportionate, i.e. more mature forms outnumber more immature forms (bands > metamyelocytes > myelocytes > progranulocytes). Myeloid blasts are generally not seen in an inflammatory leukogram and more often indicate a concurrent or underlying leukemia. An increase in immature neutrophils above the upper reference limit with a high, normal or low neutrophil count would be called a neutrophilia with a left shift, a normal neutrophil count with a left shift and a neutropenia with a left shift, respectively. Note, that at Cornell University, we usually put all immature stages under the band neutrophil heading, since band neutrophils usually dominate. We then add a comment if we see more immature stages than band neutrophils (usually indicates a more severe inflammation or stronger tissue draw). A band neutrophil count higher than the segmented neutrophil count (particularly in the presence of a low or normal mature neutrophil count) is called a degenerative left shift and usually indicates severe inflammation. A degenerative left shift is usually accompanied by toxic change in neutrophils (mature and immature forms). Neutropenia is decreased numbers of segmented neutrophils (absolute numbers not percentages), and can occur due to opposite mechanisms to those that cause neutrophilia. The most common cause is severe inflammation (increased movement into tissue), particularly when there is evidence of neutrophil immaturity (toxic change and a left shift or increased band forms). Shift from circulating to marginating pool: Occurs in acute endotoxemia. This shift contributes to short-term (1-3 hours) neutropenia seen after initial exposure to endotoxins. However, fairly quickly endotoxins also stimulate increased release and production of neutrophils in the bone marrow, so this initial neutropenia may not be noted clinically. Neutropenia may occur again later on in the course of disease, but it is then due to increased neutrophil consumption rather than alterations in MGP:CGP. Note, endotoxin studies usually involve injection of the purified toxin. In bacterial infections, there are a number of other mediators that will alter neutrophil kinetics. Decreased release from bone marrow: Congenital or inherited defects in bone marrow release in humans have called myelokathexis. This has not been reported in animals. Miscellaneous primary bone marrow disease, e.g. idiopathic born marrow aplasia, myelophthisis secondary to tumor infiltrates or primary hematopoietic bone marrow neoplasia (e.g. acute leukemia), drug-induced injury or hypoplasia, ineffective hematopoiesis secondary to Ehrlichia canis. Deficiency of cytokines (e.g. granulocyte colony stimulating factor) can also result in a persistent idiopathic neutropenia (Lanevschi et al., 1999). Congenital or inherited defect: Several different types of congenital defects resulting in neutropenia have been identified in humans including constitutional or ethic neutropenia (found more in people from Africa or Mediterranean countries), benign familial neutropenia, severe congenital neutropenia (caused by various defects, including the neutrophil elastase gene), cyclical neutropenia, and neutropenias associated with other defects, such as Fanconi anemia (Gibson and Berliner 2014). Congenital defects in neutrophil production have been infrequently identified in animals and the cyclical defect in grey collie dogs (and their crosses) is the most well-characterized of these syndromes. This syndrome results in an 11-14 day cycle of neutropenia and has been attributed to a defect in intracellular trafficking of neutrophil elastase due to decreased production of adaptor protein complex 3 β1 subunit, which helps the elastase package into granules. The elastase is thought to degrade cytokines or their receptors, resulting in a cyclical neutropenia (accompanied by mild anemia and thrombocytosis) (Horwitz et al., 2004). Viral disease: Feline leukemia virus can also induce a neutropenia, as can feline immunodeficiency virus. The mechanism for the neutropenia can be multifactorial (decreased production, increased destruction). Drugs and toxins: Various drugs, including chemotherapeutic agents, anti-epileptics (Berson et al 2014) and antithyroid medication (Peterson et al 1988), can cause neutropenia due to damage to precursors or inhibition of myelopoiesis due to direct effects or immune-mediated mechanisms. Increased migration into tissue: In response to inflammatory cytokines and chemokines. This is due to tissue inflammation (e.g. bacterial sepsis, tumor necrosis, abscess, endotoxemia). This is the most common cause of neutropenia particularly in cattle with severe acute inflammation (e.g. mastitis, metritis), which have decreased marrow stores of neutrophils that they can release in response to inflammation. The neutropenia is usually accompanied by a degenerative left shift and toxic change. In other species, a neutropenia is only seen when bone marrow stores are depleted (less common) and the bone marrow cannot keep up with demand (very severe inflammation). As for cattle, this is usually accompanied by a left shift (often degenerative) and toxic change in neutrophils. Increased destruction: This can occur with immune-mediated neutropenia (as a solitary syndrome, part of a generalized immune-mediated disease, such as systemic lupus erythematosis), histiocytic disorders including hemophagocytic syndromes (although usually other cytopenias are present) and histiocytic sarcoma, drugs (many different drugs), toxins and viruses (e.g. canine parvovirus, feline panleukopenia, bovine virus diarrhea). When destruction is peripheral, there is a concurrent granulocytic hyperplasia. However, destruction can also occur in the marrow, resulting in a range of marrow findings from pure white cell aplasia (Weiss and Henson, 2007) to granulocyte hyperplasia (ineffective granulopoiesis). An alloimmune neonatal neutropenia has been documented in human beings (Gibson and Berliner 2014). An immune-mediated pathogenesis for a neutropenia can be suspected if the neutropenia resolves with corticosteroid therapy (Brown et al 2006). Vitamin B12 deficiency in Border Collies (also appears inherited), Giant Schnauzers (Fyfe et al., 1991), Beagles (Kook et al 2014) and other breeds can also result in neutropenia, through unclear mechanisms. An intermittent metarubricytosis and mild to moderate non-regenerative anemia has also been seen in affected Collies (Lutz et al., 2013). The defect in Border Collies has been identified as a mutation in cubilin, which forms a complex with amnionless (AMN) to form the cobalamin receptor in the ileum and renal tubules. The defect is also called Imersland-Gräsbeck syndrome (Fyfe et al., 2013). Although macrocytic anemia may be expected and there are megaloblastic changes in erythroid progenitors in marrow (since vitamin B12 is required for DNA metabolism), the anemia is usually normocytic and normochromic. Idiopathic neutropenia in cats: Cats can suffer from idiopathic neutropenia (with no left shift or toxic change). The cats are usually negative for common viruses associated with neutropenia, such as feline immunodeficiency virus (FIV) and feline leukemia virus (FeLV) and are usually asymptomatic (they do not suffer from recurrent bacterial infections).Any cat with an unexplained neutropenia should be tested for these viruses. Neutrophil counts can be less than <1,000/uL but are generally slightly higher and low counts are persistently documented (Swenson et al 1988). In our experience, bone marrow aspirates are not helpful in these animals as no abnormalities are seen typically in the bone marrow (neutrophil lineage cells can be normal or hypoplastic). This neutropenia in cats is similar to chronic idiopathic neutropenia reported in adult human beings (Gibson and Berliner 2014). Breed-associated: Some breeds of dogs have lower neutrophil counts, including Tervuren Shepherds (Greenfield et al., 2000), Australian Shepherds (personal observations, Cornell University) and related Labrador Retrievers (personal observations, Cornell University). Small, mature lymphocyte are the most common lymphocyte in peripheral blood. Lymphocytes can be the most numerous cell type in certain animal species, including cattle and rodents. In dogs, cats, horses, and camelids, they are outnumbered by segmented neutrophils in health. In cattle, they are frequently seen in a 1:1 ratio with neutrophils. Most lymphocytes are smaller than a neutrophil, although there may normally be small numbers of intermediate to large lymphocytes, especially in cattle where up to 50% of lymphocytes can be intermediate in size. We size lymphocytes based on neutrophils (which are more regular in size across species, compared to RBC). With this sizing, we use the size of the nucleus, not the entire cell (since some cells with more cytoplasm than normal would be mistakenly identified as large). The distinguishing feature of lymphocytes is their dense, round to slightly indented nucleus with smooth (clumped or blocky chromatin, i.e. heterochromatin), a small amount of clear to pale blue cytoplasm with a high nuclear:cytoplasmic ratio (i.e. the majority of the cell is taken up by the nucleus with only a small volume of cytoplasm visible). 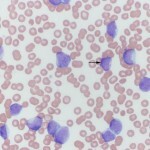 In most healthy animals, low numbers of lymphocytes have red cytoplasmic granules. These granular lymphocytes are involved in cell mediated cytotoxicity and are either cytotoxic T cells (CD3+, CD8+) or natural killer cells (CD3–). Increased numbers of granular lymphocytes in blood can be seen in reactive (e.g. Ehrlichia canis infection in dogs) or neoplastic conditions (e.g. lymphoma or leukemia of granular lymphocytes). Reactive lymphocytes are cells that have increased amounts and generally deeper blue cytoplasm. Some may be larger than a normal lymphocyte but they still have clumped chromatin. Reactive lymphocytes are responding to an antigenic stimulus that is not specific. Low numbers of reactive lymphocytes are frequently seen in young naive animals. It is important to distinguish between reactive lymphocytes and neoplastic cells (lymphoid or myeloid) in blood. For more on this, see “blasts” below and related links. Lymphocytes, unlike the other leukocytes, are produced in lymphoid tissue rather than in the bone marrow. Most of the lymphocytes in blood are long-lived cells that recirculate between blood and tissue. Changes in blood lymphocyte number usually reflect changes in distribution rather than changes in production or loss. Lymphocytosis, which indicates an increase in absolute numbers not percentages of lymphocytes, can be seen in the situations given below. The most common causes are a physiologic or age-related lymphocytosis. Physiologic leukocytosis: An epinephrine response, particularly in cats and presumably in young horses, and possibly in young animals of other species, that results in a transient lymphocytosis of mature cells. Flow cytometric studies in cats have shown the population of lymphocytes consists of mixed B and T (CD4+) cells (Avery A, personal communication). Strenuous exercise, fear or excitement can increase lymphocyte counts substantially in horses. In the above-mentioned study of 16 unbroken Quarterhorse yearlings, lymphocyte counts ranged from 5,600 to 14,000/uL immediately after they were caught for the first time (Schalm’s Veterinary Hematology). Physiologic due to youth: Young animals (usually < 6 months of age) can have higher lymphocyte counts than adults, so they appear to have a lymphocytosis when compared to reference intervals based on adult animals (Harvey et al 1983). Physiologic due to exercise in horses: In training-associated exercise, lymphocyte counts increased from an average of 2,800 to 4,500/uL at 5 minutes, decreased to an average of 3,800/uL at 15 minutes and was baseline within 30 minutes after exercise. This pattern remained consistent at the start of, and 3 weeks and 6 weeks into training (Rose et al 1983). In another study of racing Thoroughbreds, lymphocyte counts increased from an average of 4,100 to 5,700/uL in one group of horses, with a more mild increase (3,000 to 3,400/uL) in another group of horses in a different geographical region within 10 minutes of finishing a gallop (Snow et al 1983). In both of these studies, the lymphocyte counts returned to normal within 30 minutes after exercise, indicating a transient response. Although these responses are attributed to epinephrine-mediated splenic contraction or altered lymphatic flow, 2 mg epinephrine given IV to horses did not significantly change leukocyte or differential counts in one study, although changes in individual horses were not shown (Lumsden et al 1976, Proceedings of the First International Symposium on Equine Haematology). However, the latter dose may not have recapitulated the increases seen in horses with exercise or extreme stress. Antigenic stimulation: Any cause of antigenic stimulation can result in a lymphocytosis, but this is quite uncommon. Infectious agents: Infection with Ehrlichia canis can result in a granular lymphocytosis (which can be a clonal expansion of cytotoxic T cells) in blood and body cavity fluids (CSF). Bovine leukemia virus can induce a persistent lymphocytosis of B cells, that may or may not progress to lymphoma (usually does not). Protozoan infections, such as Theileriosis and Trypanosomiasis, can also result in a lymphocytosis in cattle and horses (up to 34,000/uL in one study of horses with Trypanosoma evansi [Rodrigues et al 2005]). Chronic inflammation is often listed as a cause of lymphocytosis, but is probably not commonly seen clinically except with some infections such as those noted above. Hypoadrenocorticism: The lymphocytosis is usually mild, but can be marked (up to 30,000/μL) in some animals. Usually, the absence of a stress leukogram in a sick animal is a clue as to the possibility of underlying Addison’s disease. Non-lymphoid neoplasia: Thymomas have been associated with a peripheral lymphocytosis. 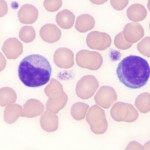 Chronic lymphocytic leukemia: This can occur in an animal of any age, but should be considered the main differential diagnosis in an older animal with an unexplained lymphocytosis. Lymphopenia is due to a decrease in absolute numbers not percentages of lymphocytes. There are several causes, the most common of which is endogenous corticosteroids (stress leukogram). Stress leukogram: This is due to endogenous or exogenous corticosteroids and is the most common cause of lymphopenia. It is due to a shift of lymphocytes from the circulating to other pools (such as decreased efflux from lymph nodes or retention in bone marrow). Chronic stress (corticosteroids, particularly with large amounts) can also cause lymphocytolysis. Acute infection: This could be mediated by corticosteroids or a consequence of the infection (decreased production, increased margination and emigration into tissues, reduced egress from lymphoid tissue into blood). Lymphocytolysis: Consequence of viral infection or corticosteroids (usually high dose). Primary (congenital) or secondary (acquired) immunodeficiency, e.g. severe combined immunodeficiency in horses. Monocytes share a common committed stem cell with neutrophils. They are produced in marrow, circulate briefly in blood, and migrate into tissues where they differentiate further to become macrophages. There is no storage pool of monocytes in marrow; their numbers in marrow at a given time are very small. Monocytes in blood are unevenly distributed between a marginated and circulating pool. Corticosteroid affect differs among species. Factors produced at sites of inflammation can increase monocyte production. Stress response: This can cause a monocytosis, particularly in dogs. Common. Inflammation (either infectious or non-infectious, acute or non-acute). Common. Recovery from acute marrow injury: e.g. secondary to chemotherapeutic agents. 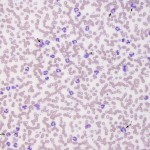 The monocytosis can be quite marked and mimic a leukemia. Uncommon. Paraneoplastic response: Various types of tumors, e.g. lymphoma, can induce a monocytosis through cytokine secretion (presumably granulocyte monocyte colony stimulating factor). Uncommon. Monocytic/monoblastic leukemia: A variant of acute or chronic myeloid leukemia. Uncommon. Monocytopenia may be difficult to document because monocyte reference intervals often go down to zero, and has no clinical significance. Eosinophils are produced from the common myeloid progenitor in bone marrow, which differentiates to eosinophils under the influence of eosinophilopoietic cytokines, such as interleukin-5. Allergies or hypersensitivity reaction: Common, e.g. allergic skin disease. Parasites: Ectoparasites or those with a migrating tissue phase. Heartworm (Dirofilaria immitis) is also a common cause of eosinophilia in dogs. Not all parasitic infections are associated with an eosinophilia and most hemoparasites (e.g. Mycoplasma) do not cause an eosinophilia (Hepatozoon is an exception but the eosinophilia could be due to tissue cysts of the parasite). Common cause of eosinophilia. Paraneoplastic response: Certain neoplasms can also promote production and release of eosinophils. This is most commonly seen with mast cells tumors, but has also been described with lymphoma (mostly T cell variants, but also B cell lymphoma), squamous cell carcinoma, and some other tumor types. The mechanism of this paraneoplastic eosinophilia is not always known, but can be due to release of cytokines by the neoplastic cells that promote eosinophil production (e.g. Interleukin-5). Hypoadrenocortism: Addison’s disease. Lack of corticosteroids can result in an eosinophilia that is usually mild. Idiopathic hypereosinophilic syndrome: This has been reported in dogs (Rottweilers) and cats (various breeds) (McEwan et al., 1985). The disease is associated with a moderate to marked persistent eosinophilia (mature eosinophils with a minimal left shift in eosinophils) and eosinophilic tissue infiltrates with no identifiable cause. Dogs respond to immunosuppressive doses of corticosteroids (Sykes et al., 2001). Chronic eosinophilic leukemia. This is a rare cause of eosinophilia in animals and must be differentiated from a reactive response (allergies or parasites), paraneoplastic syndrome, or idiopathic hypereosinophilic syndrome. Evidence of abnormal maturation (more immature than mature forms, dysplasia) in eosinophils with increased marrow blasts and concurrent cytopenias (non-regenerative anemia, thrombocytopenia) would help support a diagnosis of leukemia. Eosinopenia is a decreased numbers of eosinophils (absolute count not percentages). It may be difficult to document because the eosinophil normal range may go down to zero. Eosinopenia is most commonly attributed to increased corticosteroids (stress leukogram). Basophils are also produced from the common myeloid progenitor, however the cytokines involved in basophil differentiation are poorly understood. It is also uncertain whether basophils and mast cells (which look very similar in some species) originate from the same or a different hematopoietic precursor. Increased absolute numbers (not percentage) of basophils (basophilia) is a relatively rare finding, which usually occurs in association with eosinophilia. Basophils without eosinophils can be seen in chronic myeloproliferative disease, such as chronic myeloid leukemia and essential thrombocythemia (chronic platelet leukemia). 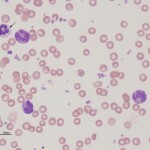 Basophilic leukemia has also been rarely reported in animals. Since most healthy animals have no basophils in blood, the reference interval usually includes zero basophils, therefore basopenia is not a relevant finding. Histiocytes is an umbrella term comprising monocyte-derived macrophages and dendritic cells. All of these cells are derived from a common myeloid progenitor in the bone marrow and are antigen-presenting cells. These cells are not normally in blood, but cells resembling macrophages (eccentric round nuclei, abundant vacuolated cytoplasm, phagocytic activity) can be seen in blood in both reactive and neoplastic conditions. Reactive conditions include inflammation, immune-mediated hemolytic anemia (erythrophagocytosis may be seen in the cells or some may contain iron if there is intravascular hemolysis), and infectious agents (e.g. systemic mycoses like histoplasmosis and protozoal infections, such as Cytauxzoon). In some of the latter cases, the causative organism may be observed within the cell (and potentially neutrophils as well, since neutrophils can also be phagocytic). Histiocytes or macrophages can also be observed in blood in histiocytic and non-histiocytic neoplasia, such as lymphoma and hemangiosarcoma. Large numbers of histiocytes, particularly those with abnormal nuclear features, should raise suspicion for underlying histiocytic sarcoma or dendritic leukemia (a rare variant of leukemia) (Allison et al., 2008). Macrophages can also be an artifact of storage (monocytes can become activated over time in vitro and resemble macrophages). Similar to histiocytes, mast cells are not usually seen in blood of non-diseased animals. Mast cells (mastocythemia) can be seen in the blood of dogs in both reactive (particularly severe inflammation), allergic and neoplastic conditions, including lymphoma and mast cell tumors (McManus, 1999). Buffy coat smears to evaluate for the presence of circulating mast cells are frequently requested in dogs with documented mast cell tumors. However, there is no proven correlation between mast cells in blood and metastatic disease. In fact, more mast cells are seen in the blood of dogs with allergies, inflammation and non-mast cell neoplasia than those with mast cell neoplasia. Mast cells are rarely observed in the blood of cats without mast cell tumors, but the presence of low numbers of circulating mast cells in blood (1-2 cells/smear) are not diagnostic for a mast cell tumor in cats either (Piviani et al., 2013). High numbers of mast cells are seen in blood of dogs and cats with systemic or visceral mastocytosis (originating in the spleen). 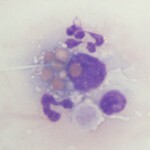 When present in low numbers, mast cells are most readily observed at the feathered edge of the blood smear. At Cornell University, we generally use the term “blasts” to describe cells in blood that we are not certain of their lineage, i.e. they could be myeloid or lymphoid. The reason we cannot determine their lineage is because they are immature cells that lack or show few features of differentiation down a particular lineage. The presence of blasts in blood indicates a leukemia. The term usually applies to mononuclear cells in blood which have fine chromatin (lots of euchromatin or a cell that is transcribing DNA actively) and small amounts of cytoplasm (high nuclear to cytoplasmic ratios). They may or may not have nucleoli (these may not be obvious in Wright’s-stained smears, so nucleoli do not make or break a “blast”). The cells are usually large (the nucleus is bigger than a neutrophil), but some blasts have nuclei that are the same size as neutrophils and are much harder to distinguish from normal lymphocytes in blood. Although we use various cytologic features (e.g. 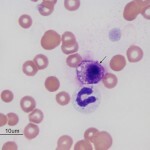 presence or absence of cytoplasmic granules, nuclear shape), along with hemogram findings (presence or absence of cytopenias), to presumptively identify the cell lineage of blasts (myeloid or lymphoid), these features alone cannot reliably determine cell lineage. Additional testing (immunophenotyping, cytochemistry) is usually required for determination of cell lineage. At Cornell University, we place “blasts” in the “OTHER WBC” category (if there are sufficient numbers to be counted in a differential leukocyte count). We do not usually code reactive lymphocytes in this category, but rather indicate their presence by adding a comment or semi-quantification to the WBC exam part of our hemograms. It is also important to distinguish blasts from large reactive lymphocytes, which can really mimic each other. Again, we use various findings, including clinical signs, hematologic results, cytologic features of the cells, to help make this determination (i.e. everything is context- or case-dependent). In some cases, we cannot distinguish between “blasts” and reactive lymphocytes. In such cases, evaluation of the patient for evidence of cancer or serial monitoring of the patient will be needed to help with this distinction. Leukogram patterns: How we interpret changes in leukocytes and recognize patterns that give us underlying disease processes, e.g. inflammation, leukemia. Morphologic features of leukocytes: This includes a table on features that we use to help distinguish between reactive and neoplastic cells in blood. Leukemia: Classification of leukemia and tools used to differentiate between different types of leukemia. “Big blue cells”: Algorithm of guidelines for distinguishing between reactive and neoplastic cells in blood. Clinical Pathology Laboratory in the Animal Health Diagnostic Center at Cornell University: Information on clinical pathologic tests including immunophenotyping. This includes tests we offer and recommendations on sample collection and handling.